Chicken Cakes with Remoulade Sauce - CRAZY good!! Perfect for holiday parties! Chicken, red pepper, green onions, mayo, mustard, Kikkoman Panko bread crumbs, cajun seasoning and egg. Ready in minutes. Can make large cakes for a main dish or smaller cakes for appetizers. Make ahead and freeze for later. The holidays are here and that means holiday parties! Woohoo! 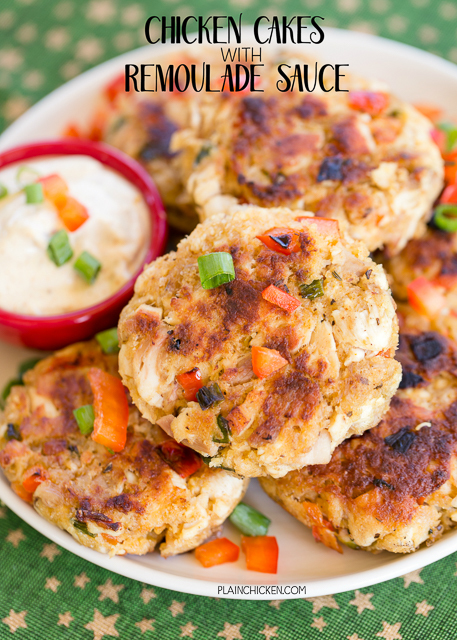 These Chicken Cakes with Remoulade Sauce are perfect for all your upcoming holiday parties. These can be served as a main dish or as an appetizer. I made 8 large Chicken Cakes, but you can definitely make them smaller for holiday party appetizers. You can even make the cakes ahead of time and refrigerate or freeze them until you are ready to fry them up! These Chicken Cakes with Remoulade Sauce are CRAZY good! Chicken Legs couldn't stop raving about this dish. They are so simple to make. Chicken, red pepper, green onions, mayo, mustard, bread crumbs, Cajun seasoning and an egg. The cakes are not spicy. The Cajun seasoning just gives them some flavor. We served the Chicken Cakes with a super easy Remoulade Sauce. It wasn't a perfectly authentic remoulade sauce, but it was SO good! It would go with just about anything. Make it a day ahead of serving. The flavors get better as it sits in the fridge. I used half of a rotisserie chicken and some Kikkoman Panko Bread Crumbs in the cakes. The Panko Bread Crumbs were perfect in the Chicken Cakes! The bread crumbs are light and crispy and don't overpower the chicken. I hate when I order crab cakes and they are nothing but breading. The bread crumbs are less dense, so they absorb less fat, cook cleaner and "eat lighter" than ordinary bread crumbs. They really made the difference in the Chicken Cakes. To make Chicken Cakes: In a skillet over medium heat, melt butter. Add chopped pepper, onion and garlic to skillet and cook until vegetables are tender, 4 or 5 minutes. Combine cooked vegetables with chicken mayonnaise, mustard, Cajun seasoning, Kikkoman Panko Japanese Style Bread Crumbs and egg. Form chicken mixture into 8 patties. Heat olive oil in skillet, cook cakes for 3 minutes on each side. (May need to do this in batches depending on the size of your skillet). Drain on paper towels. Serve immediately with remoulade sauce. To make Remoulade Sauce: combine mayonnaise, mustard, Cajun seasoning and lemon juice. Refrigerate until ready to serve. These look delicious!! 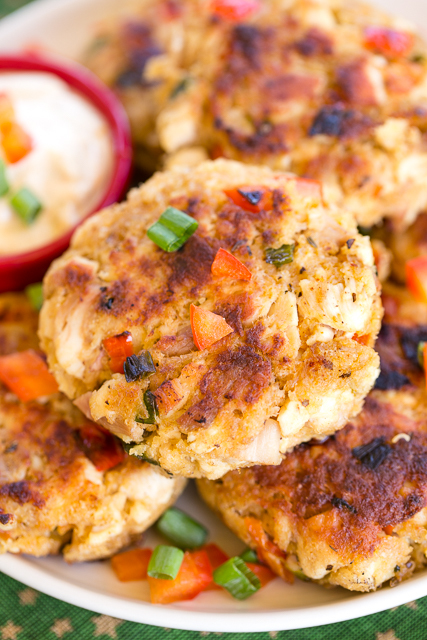 We love crab cakes but I never would have thought to make a chicken version, can't wait to make these! I use all different kinds of bread crumbs, depending on the recipe, but I usually go for panko!! Never thought of chicken cakes - great idea and they look delicious. I think I've only ever used Panko. I may make.them this.weekend. They look yummy. I usually just use Italian seasomed breadcrumbs. Panko crumns are.still.hard to find where I live. The only kind I've used is Panko, and they are so good! I like to make mozzarella bites with them...Yum! I use both panko and regular bread crumbs depending on what I am making. Question: how do you think canned chicken would work in this? I have on occasion used it to make chicken salad and it works pretty well. Seems like for this recipe it would be a good substitute. These look so good! I use Panko for all kinds of stuff- they're indispensable in my pantry! This recipe looks delicious, I can't wait to try it! I always use panko inplace of breadcrumbs, I prefer it's texture and how light it is. I use to make my own bread crumbs but after tasting how good Panko bread crumbs are I switched to using them. I use Panko and also 4C bread crumbs. Thanks so much. I love to use panko and I also love making my own! I cook with Italian Seasoned bread crumbs. I make my own break crumbs to use in meatloaf and as coating. 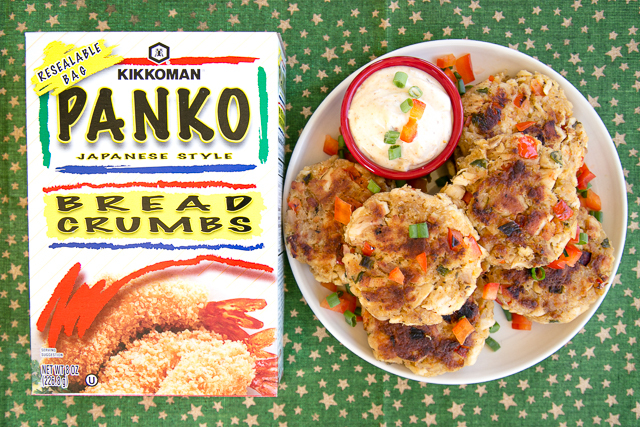 I love this brand Kikkoman Panko bread crumbs and I used it many times to make my Coconut Chicken. I also use panko bread crumbs to make my Chicken parmesan! I use Progresso Italian breadcrumbs. I almost always use Panko bread crumbs unless my store is out of it. I use Panko breadcrumbs.. normally store brand though! I usually use plain or Italian bread crumbs. I usually use Panko bread crumbs to cook with in my recipes. I like to use Italian style bread crumbs in my meatballs for flavor. I also add parmesan cheese to them. They are really yummy. I use Panko most of the time, my family enjoys the lighter, crispier texture. I shared on Twitter: https://twitter.com/FireRunner2379/status/811631492296298496. I use Panko when I want a lighter crisp crust, seasoned Italian breadcrumbs for a heavier more savory crust. I use Panko crumbs for most things, but I like fine seasoned Italian bread crumbs for my meatloaf and meatballs. I use panko breadcrumbs because it's so versatile. I make my own bread crumbs. I usually use plain, but occasionally Italian breadcrumbs. I actually use this brand of panko almost exclusively, unless I can't find it. But panko is my def go to for bread crumbs. We usually make breadcrumbs from leftover sourdough bread from Boudin Bakery. We use an Italian seasoned bread crumb, this looks like a great recipe to try. TY! The style of bread crumbs that I cook with are the ones with garlic and salt added, for more flavor. I like using Kikkoman Panko Bread Crumbs. I use Pandora breadcrumbs on my homemade honey chicken nuggets.